Please complete the form below and your enquiry will be sent directly to L'Agulhas Seafoods via email. Your enquiry has been sent to L'Agulhas Seafoods. The famous L'Agulhas Seafoods in Cape Agulhas is open for brunch, lunch, sundowners and dinner, seven days a week. Located at the Southernmost tip of Africa, locals and visitors can get their seafood fix while relaxing at a table in the indoor and outdoor seating areas. Here the seafood is so fresh that if it were any fresher it would still be swimming in the ocean. Linefish specials run daily with Snoek, Hake, Yellowtail, Cape Salmon, Stumpnose and Cob served according to availability. Whether you like it grilled or fried with batter, be sure to try L’Agulhas Seafoods' melt-in-the-mouth calamari and for those who crave Salmon Roses, California Rolls and other raw fish tidbits, there is a sushi chef on site to create all your favourites. L'Agulhas Seafoods is fully licensed and the perfect venue for functions with seating for a total of 120 people. Click on ‘More Info’ below to find out more about L’Agulhas Seafoods. Treat your guests to a fresh seafood feast when you have your special event at L’Agulhas Seafoods. Your hosts, Lindie and Derek Snyman, will customise a seafood menu to suit your taste and your budget as well as outsource any non-menu items for those guests who have special dietary wants and needs. L’Agulhas Seafoods seats a total of 120 people and there is ample parking available. For more details contact L’Agulhas Seafoods directly. 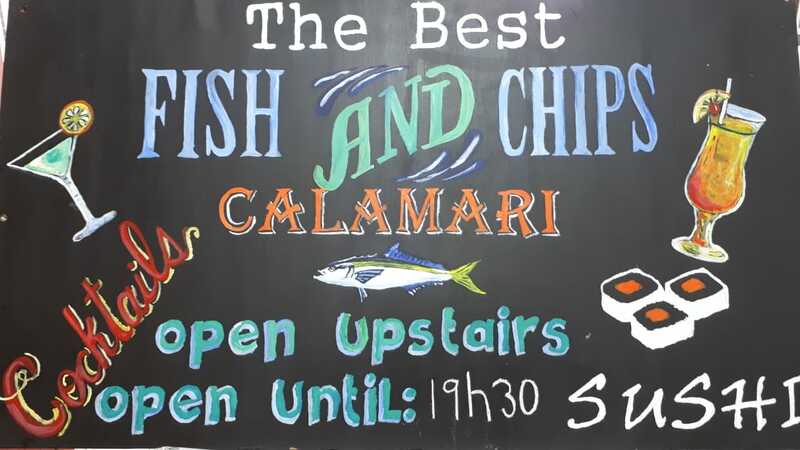 Description : For the best fried fish, calamari & chips.